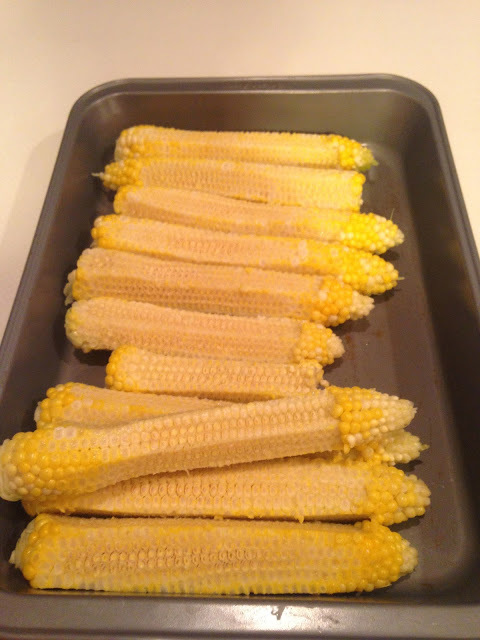 Freezing Sweet Corn…A Favorite Time Of Year! 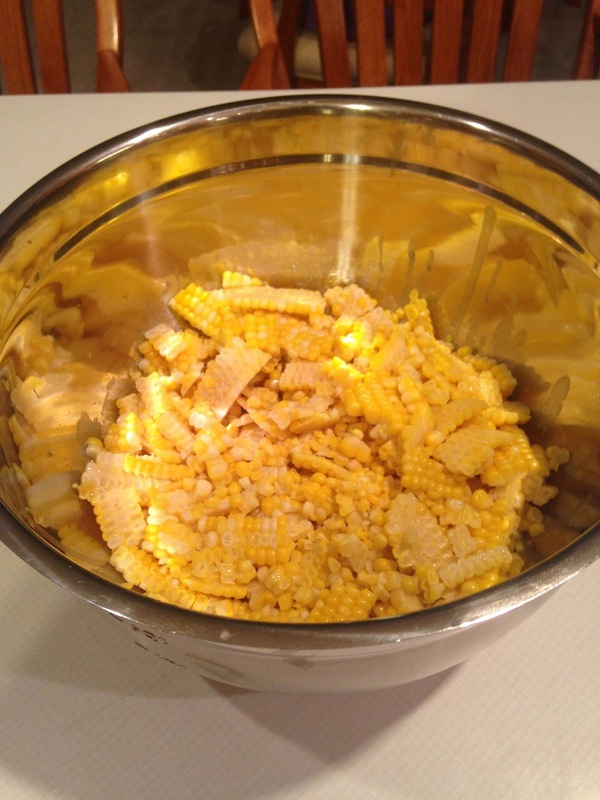 It seems sweet corn time of year is a lot of people’s favorite time of year. If you find yourself wanting to buy it by the dozens I suggest you do! 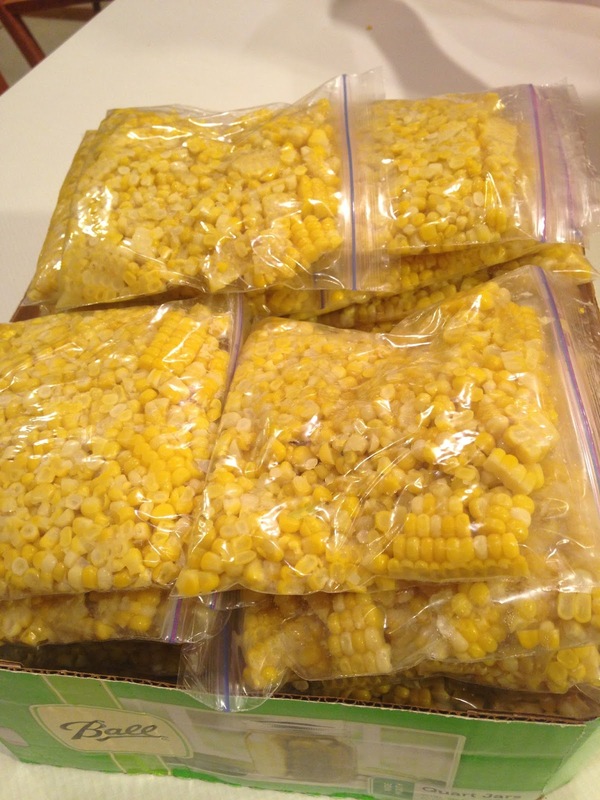 This is another super easy way to freeze sweet corn so you can enjoy it all year long. I posted on this last year, but I have added another super simple trick to make this work easy for you. 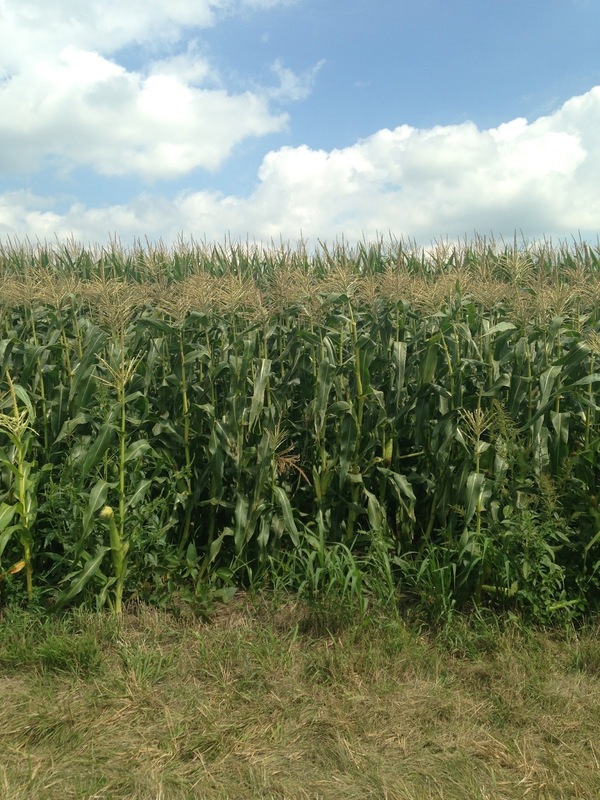 This is our sweet corn patch. The short stuff in the front is the sweet corn, the green tips you see at the very top is actually our field corn in the back. 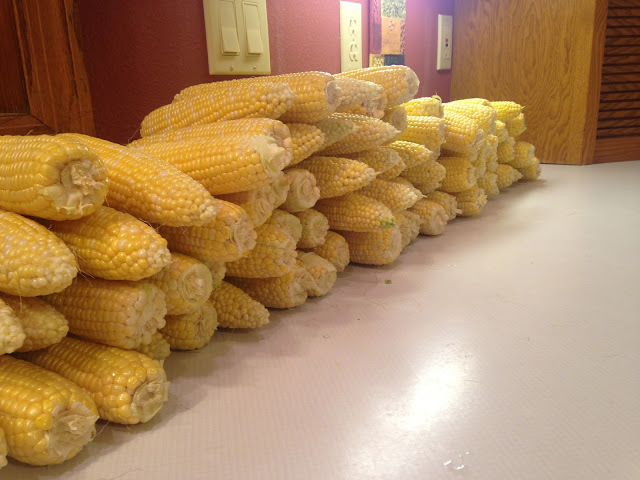 I spent about an hour picking over 100 ears of corn while our daughter napped. 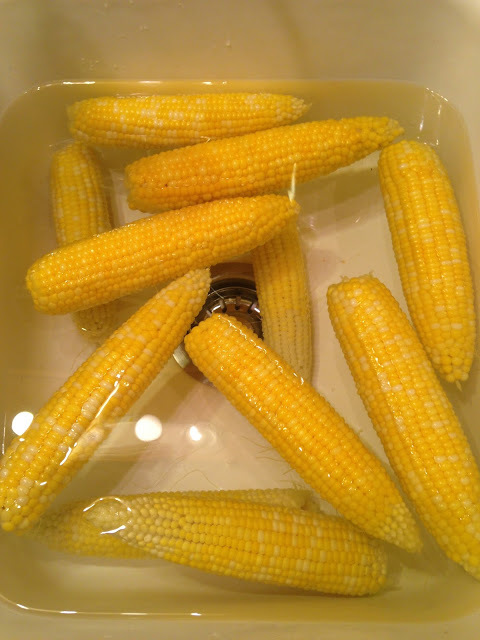 I brought the pick up and lots of old tubs to store the corn until I could get home to start shucking. Since my daughter was still napping when I got home I stood outside and shucked all the corn, I threw all the husks in our feed bunks for a treat for our cattle behind the house. I then brought them inside a little at a time and lined them up on the counter. 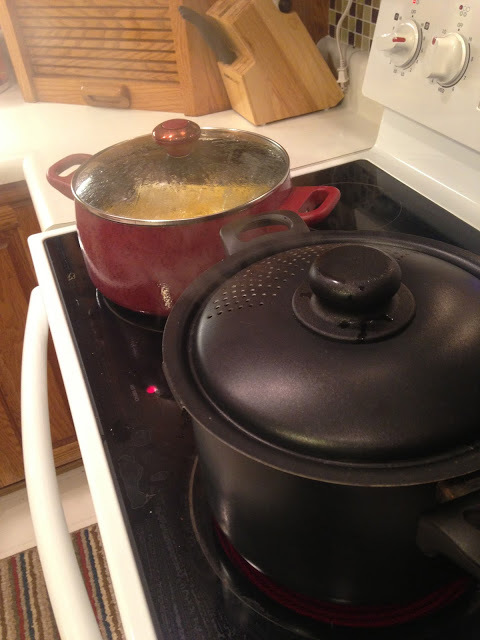 I started boiling two pots of water. Keep a few large measuring cups on hand because the more you boil the more water will evaporate out and you will have to add more. I put five ears in each pot, so ten total, and boiled for about 6 to 8 minutes. I then transferred them from the pots to my kitchen sink that was filled with ice cold water, to blanch them…or stop the cooking process. My kitchen sink was scrubbed clean before I filled it with ice cold water. Once the ears were cool I transferred them to the counter in a pan and my husband started the cutting. We used an electric knife to shave off, which I used last time, but a the new tip is adding this bundt pan underneath. 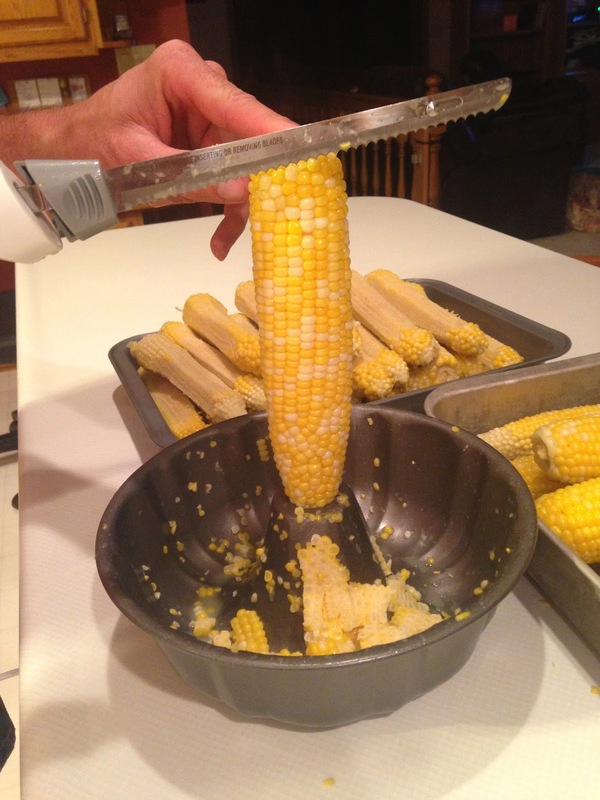 It has the perfect spot to sit the corn to shave off into the pan. Have a place to discard the ears. And once your bundt pan is filled dump it into a bigger bowl. I then put about a cup and a half into regular sandwich baggies and laid them flat for freezing. 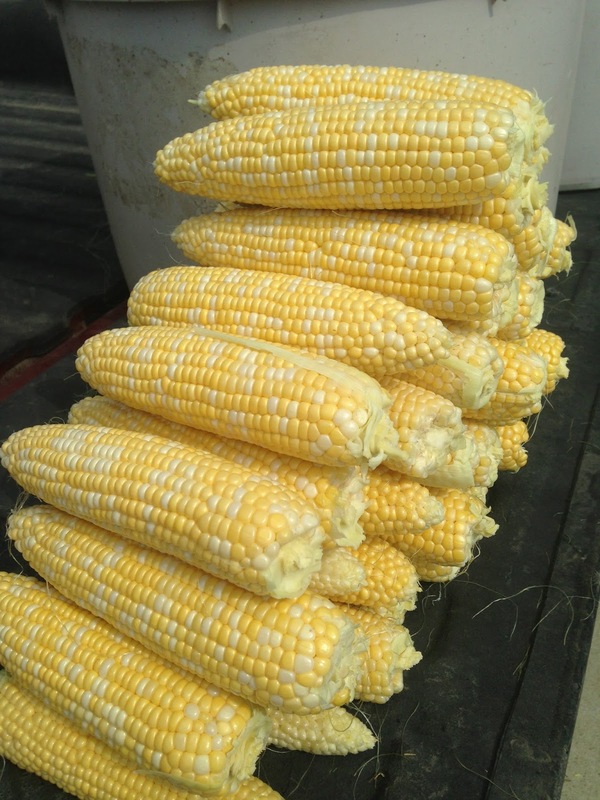 My 100 plus ears of corn should give us enough sweet corn for one bag a week for the next year! This is such a simple process it’s perfect to stop at your local farmer’s market and pick up a couple dozen, or ten dozen, and make an evening of it like we did! It was a perfect, fun little date night after our daughter went to bed! I do the bundt pan thing to, but I cut mine off the cob first, cold. Then put it in a pot to boil with just a little bit of water. I also add butter, a touch of sugar and salt too. Makes is SO yummy! I agree Lori! But, tons more work it seems now that I have a little one attached to my leg! Haha!